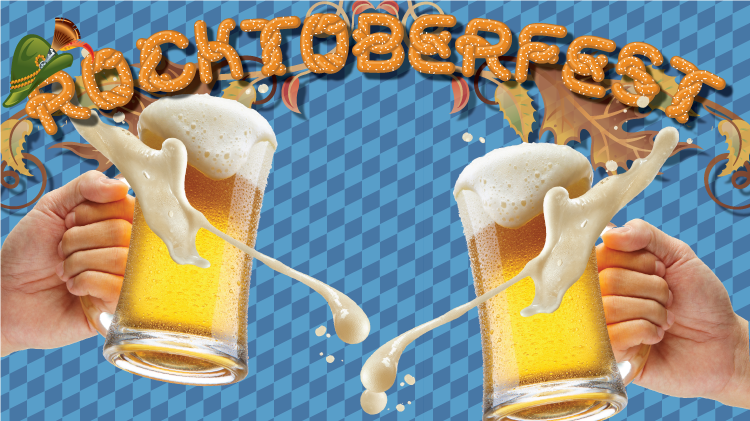 Date: Sep 28 2018, 3 p.m.
Join us at Heritage Hall on Rock Island Arsenal for some Bavarian merrymaking at our annual Rocktoberfest! New this year, this event features something for family members of all ages, with bounce houses, balloon animals, face painting, and kids activities on the lawn of bldg. 60 so bring the whole crew! There will be lots of German style beers, schnitzel, bratwurst, pretzels, and Funktastic 5 will be performing starting at 6:30! Customized beer steins are once again available for purchase, check out this year's design below. Pre-purchase your stein now for just $20 which includes your first beer. Hurry and get yours today, supplies are limited! Steins can be purchased at the Arsenal Island Clubhouse or Lock & Dam Lounge. This event is open to the public and there's no need to get a visitors pass, just show your state issued ID at the gate. Call 309-782-4372 for more info.